University Park, Pa. — As the need for buildings with superior efficiency, health, comfort and durability capabilities continues to rise, so does the need for superior architectural engineering education, team integration and collaboration and cohesive building processes. Robert Leicht, associate professor of architectural engineering, uses organizational theory, communication theory and information and process modeling to research how to best assemble integrated teams and develop integrated processes in order to design and build ultra-high-performing buildings. He evaluates building projects’ costs, schedules and quality performance under different project delivery methods. 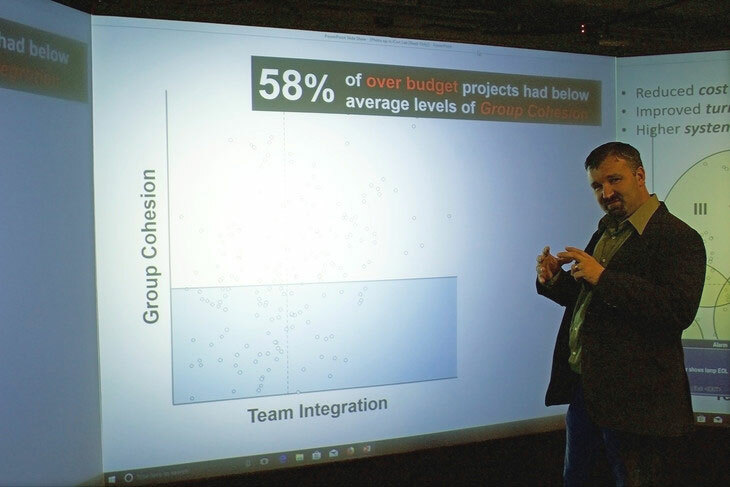 By studying team interactions, including design charrettes, goal-setting and building information modeling (BIM) use, Leicht investigates the best approaches for team integration and collaboration. “The design and construction services offered in the building industry are really about the ability of personnel, architects, engineers and construction managers to process the needs of a client and translate those needs into building designs, integrated systems and ultimately, the construction of a facility that provides function and value to the clients,” he said. While it is possible for divisive and adversarial teams to deliver facilities, Leicht said projects from combative teams are often late, expensive and suboptimal. By providing a better understanding of how delivery methods impact team development and how that relates to improved project performance, Leicht’s research potentially will directly influence national and international building infrastructure. Innovations in team performance and project delivery will lead to advancements in undergraduate and graduate education, specifically related to the design, build and maintenance of ultra-high-performance buildings. Integration and collaboration skills will be further embedded into the architectural engineering curriculum at Penn State through the development of increased breadth awareness and appreciation of tasks and design processes that each specialty designer or trade undertakes. “By understanding, at a high level, how others perform their work and what drives their processes, our students are better able to understand the value proposition of collaboration. In addition to this appreciation, we embed opportunities for students to collaborate both in engineering problem-solving and the integrated design processes. These develop their designs skills and competencies in parallel with their teamwork skills,” Leicht said. Leicht’s integrated project delivery efforts emphasize building design based on occupant behavior, construction process improvements to decrease costs and increase performance, and building maintenance innovations. Instead of isolating disciplines, the approach brings together architects, engineers and builders to plan, design, construct and maintain buildings. This defined, holistic building design method will help improve occupant comfort, safety and productivity while decreasing energy consumption and building system inefficiency. “The purpose of a building is to enable and support its occupants. It doesn’t matter if it’s a tiny house or a hospital, the design and delivery process needs to leverage the full range of expertise available to ensure our building infrastructure is optimized as a facility, not sub-optimized as a set of systems and processes,” Leicht said.